Is man-made carbon pollution a threat to the global climate? I could discuss the 5th grade science lessons about how man breathes in oxygen and breathes out carbon dioxide while plants take in carbon dioxide and give off oxygen. We could talk about whether or not science has proven global warming, or global cooling or any other climate change model. All of that is a waste of time. We should simply consider what the legislators are proposing we regulate and tax. They want to regulate and /or tax “man-made” carbon pollution. Now, carbon appears in the atmosphere at 40,000 parts per million. 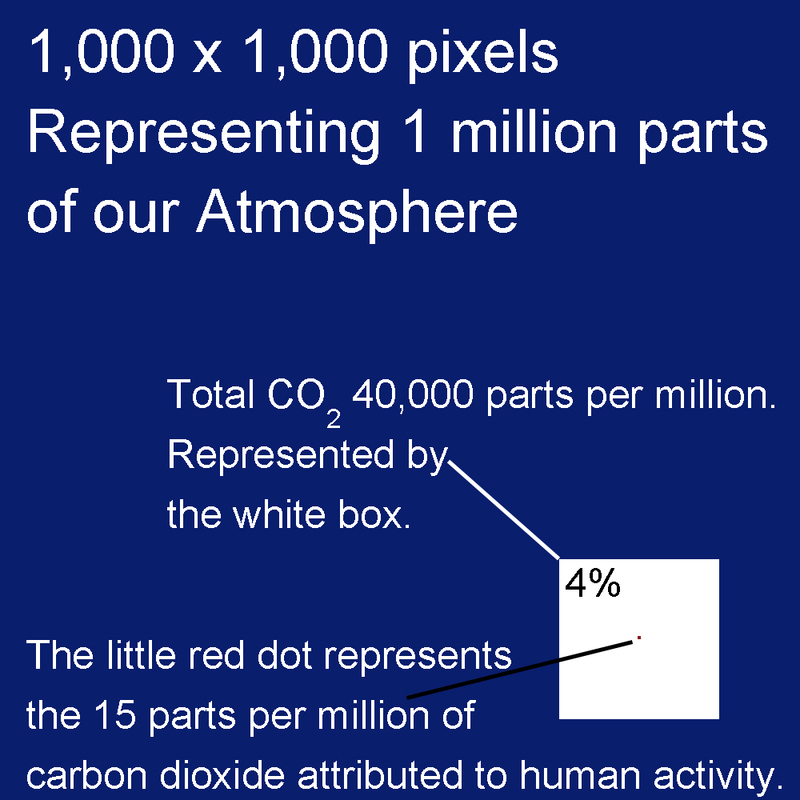 In other words 4% of our atmosphere is made up of carbon. Of that, 15 parts per million are contributed by man. Are we to believe that regulating 15 parts per million of our atmospheric content will make a meaningful environmental impact? I am quite certain it will make a meaningful economic impact. Here is an illustration showing our atmosphere in blue, our carbon portion in white and the man-made contribution to that carbon component in red. Can you see the red dot? That’s what legislators want to regulate. Actually, that red dot is 4 x 4 so it is 1/16 too large to accurately represent the man-made contribution to carbon in our atmosphere !!! That dot represents the portion of our atmosphere that our legislators are attempting to regulate. Talk about a scam !! !